Young Winemaker of the Year in 2009, Ryan Aggiss has claimed various trophies and medals at national and international wine shows, enjoyed a sabbatical through France’s renowned wine regions, undertaken an internship in the Napa Valley, California, and worked as a winemaker in all regions of Australia. 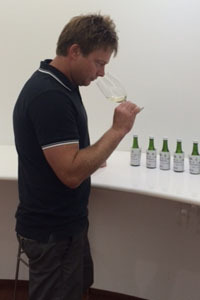 A passionate winemaker for the past 10 years, Ryan said CSU’s Bachelor of Applied Science (Wine Science) was his first choice due to the regard the degree has in the industry, adding that he often draws on the technical advice and experience of his university peers, many of whom are now successful winemakers in their own right. Here Ryan explains why he delights in the challenges of winemaking and dreams of one day making the greatest ever Australian Bordeaux blend. I’m currently… In charge of the daily winemaking at Houghton Wines Nannup, a 5000Tn facility in the South West of WA. I am extremely proud and satisfied of my current role and relish the challenges the position entails on a daily, weekly and monthly basis. At school I... was the kind of kid who was restless and always thinking of the beach or bush. I was intelligent enough to get good grades, but was easily distracted by funnier and more mischievous antics. My childhood was... full of outdoor life, great food and good times. I was the first in my immediate family to attend university. It provided my family with an immense level of pride that I was able to independently attain such a high level of education. I chose CSU because… It is renowned in this industry as without a doubt the best wine science/viticulture/wine marketing degree in Australia, with an excellent record of distance education capabilities. My best experience at CSU... Wine Sensory 2, amazing wines, and meeting and nurturing my network of industry peers. My worst experience at CSU... the sometimes bleary-eyed microscopy classes in the morning after one or two too many Coopers Pale at the Ag bar the night before. At university I was inspired… to be the best I could be, be that professionally, personally or creatively. Today I’m motivated… to make the best wines for Australian consumers I can. To experiment and continually trial winemaking practises and to create inspiring wines for all. To be a mentor and teacher for new winemakers. To be a good man. To always operate with the environment at the forefront of my mind. In my profession it is important to… be ever evolving and maintain touch with consumers. To never be scared to take a risk. To always be environmentally-minded. I never dreamed I would… enjoy my job so much. Passion is the wheel which moves the cart. The biggest influence in my life... were three things: my Mum; my desire to reduce the perceived distance between food and wine appreciation; and Simon Osika, a great winemaker and a great man. I’m most proud of… my evolution of learning, be it science-based or artisan-based. My greatest achievement is...The 2013 Houghton Gladstones Cabernet Sauvignon. In the future I’d like to… make the greatest Australian Bordeaux blend, both red and white, ever made. The best piece of advice I ever received... Never assume anything, and never do anything to people you wouldn’t like done to you. The single-most important issue in the world is… climate change and sustainability. The thing I wish I had done but never got around to... go to Germany. If I could do it all again I... might reduce the late nights at the Ag bar…..
One last thing... strive to be the best you can; respect the earth and each other.